Every visit to Lichfield includes a pilgrim visit to the chapel of Saint John’s Hospital, with time for prayer and giving thanks for the all the blessings I have received in life, especially since I first visited this chapel as a 19-year-old back in 1971. After breakfast this morning, I called into the chapel again, and went for a walk in the grounds, which are like an oasis in the heart of Lichfield. I was invited back to preach in the Chapel at the Festal Eucharist earlier this summer [24 June 2015]. Since then, the skeletal remains of about 50 mediaeval people were found in shallow graves near this pilgrim site. The human remains, which have been exhumed in recent weeks, may help archaeologists learn more about the mediaeval era, according to Archaeology Warwickshire. The archaeology and excavation company is studying each skeleton to determine the gender and age at death of each person, and looking for evidence of injuries or diseases preserved in their bones. Archaeologists found the shallow graves during a building project two or three months ago [August 2015]. The graves are relatively shallow, about 0.5 meters (1.6 ft) below ground. Just before a planned expansion to the accommodation on the site at Saint John’s Hospital, including 18 new apartments, Archaeology Warwickshire surveyed the grounds around the mediaeval almshouse. The archaeologists expected to find some graves but “we weren’t really expecting the volume and quantity that we got,” says Stuart Palmer. “Although mediaeval burial sites are not uncommon in the UK, those associated with known sites of pilgrimage are not so common and this work presents a rare opportunity to study such a particular assemblage,” Stuart Palmer said. The remains were taken to the group’s offices at Montague Road, Warwick, where the bones have being cleaned, aged and sexed and examined for signs of injury, disease, dietary deficiency and other pathologies. Saint Chad, who had a large following, founded his monastery at Lichfield, where he was abbot and bishop and where he is credited with converting the Kingdom of Mercia to Christianity. When he died in AD 672, he was proclaimed a saint, and people reported miracles at his tomb in Lichfield. Saint John’s Hospital was established in 1135 adjacent to the Culstrubbe Gate, one of the four gates erected on the perimeter of Lichfield by Bishop Roger de Clinton (1129-1148). The Culstrubbe Gate crossed what is now Saint John Street. Saint John’s provided overnight accommodation for pilgrims for several hundred years while it was a house of the Augustinian Friars. Many of the pilgrims came to be healed and some may well have died during their journey. The 50 or so people — adults and children alike — whose graves have been found at Saint John’s may have died there during their pilgrimage. Most of the bodies were laid flat on their backs, arranged in rows, and covered with dirt. Many of the skeletons are not in good shape, however, because they were buried in acidic soil, which is typical of dirt in the area. If the bones are in good condition, the archaeologists may analyse their DNA and isotopes, which can tell researchers where the pilgrims lived previously. After that, the skeletons may go to a museum. Archaeologists from Archaeology Warwickshire are working on the site alongside Paragon Construction to ensure that work continues and excavation research is carried out. Work started on the new apartments around July. The trustees of Saint John’s commissioned the Worcester-based Architects KKE to design a building “which resonated with the Tudor building,” using innovative 21st century building techniques. The new buildings, forming a second quad at Saint John’s, are to be built using Passivhaus technology, providing “a high level of occupant comfort while using very little energy for heating and cooling.” The grounds are also being landscaped to complement the accommodation. After visiting Saint John’s this morning, I returned to Lichfield Cathedral for the mid-day Eucharist, continuing this pilgrims spiritual journey through Lichfield. I may never read John 16 in the same way after taking part in the Opening Worship and Reflection for Us volunteers in the Diocesan offices of the Diocese of Birmingham yesterday [23 October 2015]. I was there as a Trustee of Us, the Anglican mission agency formerly USPG , (the United Society for the Propagation of the Gospel) as Carrie Myers, Us Volunteering Manager, and Davidson Solanki, International Programmes Manager, spoke of the work of Us. Volunteers and representatives of over half a dozen dioceses in the English Midlands (and one from Wales) were present in a conference room looking across to Saint Philip’s Cathedral, which is celebrating its tercentenary this year. A woman from the Diocese of Southwell turned to those words about a woman in labour who is in pain and whose pain turns to joy when her child is born. She described for us the sorrow and joy of her encounter with two women she met recently on a train travelling from Serbia to Austria. One was breast-feeding her child; the other was visibly pregnant, and in her opinion would probably give birth in about two months’ time – a Christmas baby, born at the same time as the Migrant Mary gave birth to the Christ Child who would himself become a refugee in the East Mediterranean. It was a startling link between the pain of refugees and migrants in Europe and the Incarnation, the meaning of Christmas. Later, in his presentation, Davidson Solanki recounted a story from the Diocese of Sittway in Myanmar (Burma), where health works often travel between remote areas by boat. He told the story of woman about to give birth, but who faced complications. Her parents were frightened and had no help. When the baby was delivered, the placenta was stuck, panic set in, but the traditional attendant not able to help. By the time a local church worker, who was 2k m away, arrived the baby had died and the woman was in a serious condition. Although she could not help with the dead baby, she was able to help the mother who slowly recovered, and so the whole community was educated about primary health care. In the Greece, where Father Malcolm Bradshaw is the senior chaplain at Saint Paul’s Anglican Church in Athens, the Anglican Church is responding to immediate needs created by the current refugee crisis in Europe. Thousands of migrants from Syria, Iraq, Afghanistan, Pakistan and other countries have filled the squares of Athens. In Afghanistan, these people are experiencing the threat of immediate death from the Taliban, while their experiences of escaping, running away, being on the move means they have exchanged this threat of immediate death with what one of them described as a slow death. It is not an easy journey, and they see Greece only as a transit point, with most of them hoping to reach Germany. But their experiences are mixed ones, including those of shock, chaos and hope. Maria, a captain from the Salvation Army, is preparing and distributing sandwiches in the squares of Athens from 4 a.m. each morning. “I’m trying to be Jesus to the migrants,” she was reported as saying as she tries to feed and cope with traumatised women, children and old people. We heard of traffickers, exploitation, shops that are reopening with some happy to find new custom in the midst of economic recession, and others exploiting the opportunities presented by the arrival of these people. How do the Churches provide hope, or seek to find safe passage in these circumstances? Despite their past differences, five churches have come together to work on these problems on the streets of Athens. Us has been asked to work throughout Britain and Ireland on behalf of the [Anglican] Diocese in Europe as it seeks to fund this work. As part of this year’s Advent Appeal, Us is inviting churches to pray for refugees in Europe and around the world as they light their Advent candles. The Diocese in Europe has chosen Us as the official agency for Anglican churches to channel donations to support its work to care for the refugees arriving in Europe. 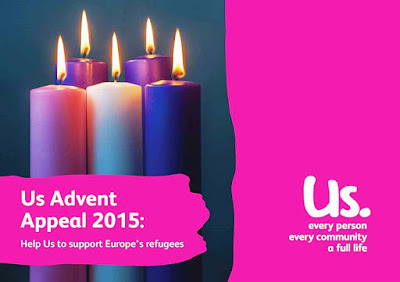 Us is asking parishes and people to pray for the refugees in Europe while lighting Advent candles in churches. A prayer card provides reflections for each Sunday in Advent, and Advent candle prayer cards are available now. Donations will help to meet the emergency needs of refugees over the winter months, as well as funding a longer-term support strategy. There is a particular focus on Greece, where local churches and agencies are working together to provide refugees with food, shelter and healthcare. From 5,000 to 7,000 people arrive on the shores of Greece every day. In the midst of this crisis, the Anglican church is feeding 800 people a day on the streets in Athens. The irony was not lost on anybody yesterday that Greece is the country with the greatest economic crisis in Europe yet is facing the greatest demand on its resources. Meanwhile, winter is fast approaching, northern borders are closing, and Church leaders suggest Athens is going to be in the eye of the storm. Immediate aid is needed, but this is not going to bridge the gaps between expectations and experiences, between what is possible and what is hoped for. One person at the meeting asked whether there a long-term strategy for the Churches in Greece, how long is this sustainable, and whether the Churches are just facilitating people to take the onward journey. Most migrants see Greece as a transit point, and they do not want to stay there long-term. We were told that even the churches in Greece are not sure about what the future challenges are. This is first time they have responded together, and despite past differences and mutual suspicions that are not avoiding the issue, instead have moved to the forefront. “This is being the Church,” one person declared. The Churches are coming together in unity rather than working in isolation. But Churches in other countries too, all along the line up to Germany, need to ask themselves how the Churches can help to provide safe passage from the countries of origin, through passage and transit, to the final, hoped-for destination. How can the Church be with these people all the way? Meanwhile, Us is launching a new study resource next month, Migration and movement, which should prove poignantly relevant and useful in parishes and dioceses in this islands in Lent 2016. I arrived in Birmingham in time for the early morning Holy Communion at 8 a.m. in Saint Philip’s Cathedral. Later, before the meeting, I was given a personalised tour of Saint Chad’s Roman Catholic Cathedral , perhaps one of the finest architectural works by AWM Pugin. The meeting finished in time for me to get to Lichfield Cathedral for Evening Prayer. But even as I walked around Stowe Pool as the dusk of evening turned to the dark of night, I found it difficult to do anything but pray for those migrants caught every night in the waters of the Mediterranean, hoping against hope that “Europe is offering them life,” and praying that the Church will be Jesus to them.